You want pho? Then don't come here. You want a spicy beef stew with meltingly soft carrots you can dunk with bread? This is the place. Happy Snack Cafe House used to be around the corner in a tiny hole in the wall space. It has expanded to a larger store on The Crescent and expanded it's offerings too. There's more room to sit or you can grab takeout and feast at home. 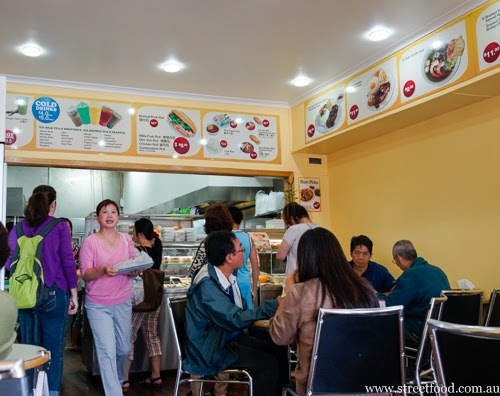 They don't serve pho, but the rest of the offerings are more than satisfying. 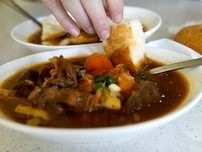 One of the most popular dishes here is the Bò Kho (Beef Brisket with Toasted Bread), $6. 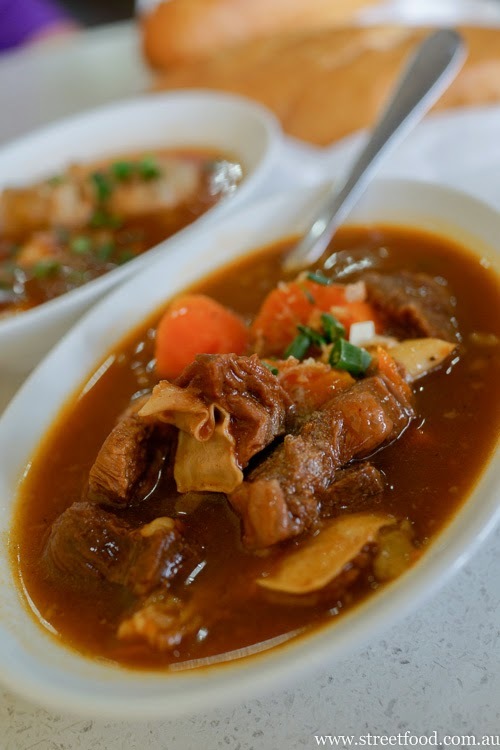 This is a Vietnamese beef stew flavoured with star anise, made with a hearty cut of meat that takes well to a long slow braise. The carrots are a favourite part, super soft and sweet from the long cooking process. Xúi Mại Trứng (Dip Dip with Toasted Bread), $6. Until this reached the table, we weren't sure what 'dip dip' was going to mean. Xúi Mại are Vietnamese chicken meatballs, and the sauce was a sweetish tomato mix over a fried egg. 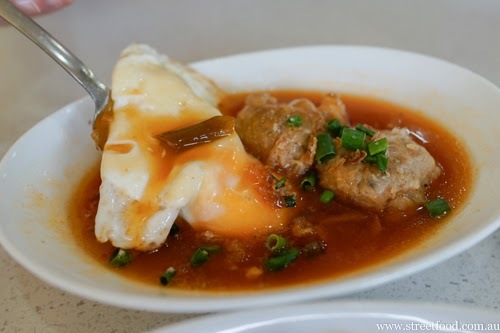 The yolk was soft and runny, perfect when mixed in with the sauce and scooped up with the crisp warm bread. 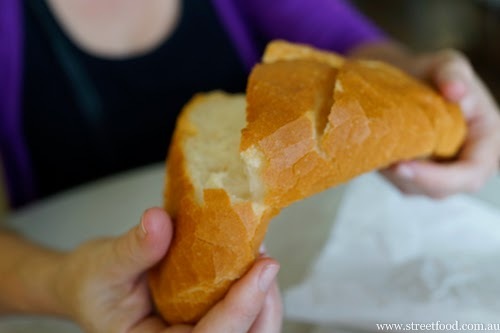 Crisp baguette, pre sliced into three so you can break without getting too many bread crumbs all over the floor and table. Dunk. And the world dunketh with you. The drinks are a drawcard at Happy Snack Cafe. 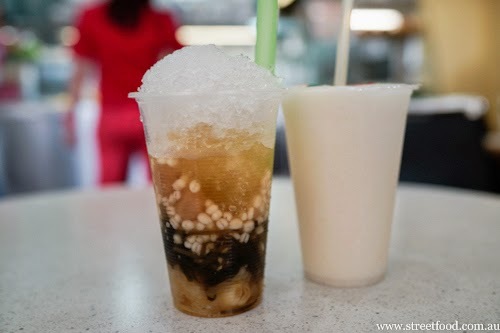 The Sam Bo Luong has smooshed ice with kelp, white fungus, logan, barley and (we think) dates. It sounds like a witch's brew but it tastes great, the sweet and savoury flavours are well balanced, a lesser drink-maker could make a balls-up of this one. The soursop drink raises eyebrows even higher, a magic balance of ice and creamy fruit. Mr Shawn is a deft fruit smoothy maker but he tips his blender lid to the Happy Snack folks. 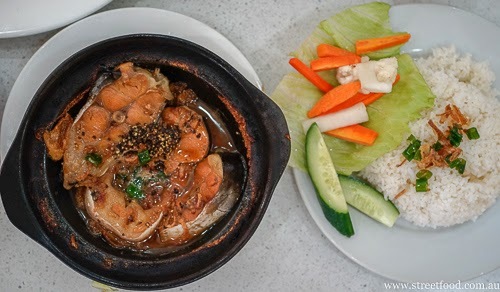 Braised fish and rice - $11. Fish fillets in a pepper sauce, that's a healthy mound of ground black peppercorns on top of the fish. The broken rice is served with fresh and lightly pickled veg. Pork chop combination - $9. 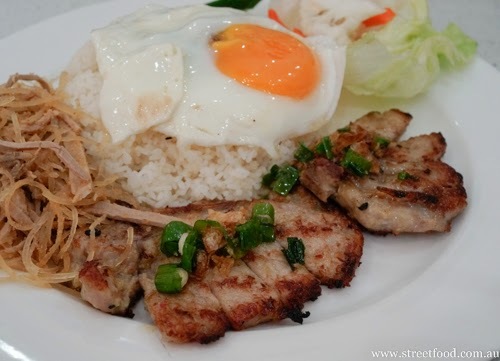 One of our faves - grilled pork chop with broken rice and fixin's. 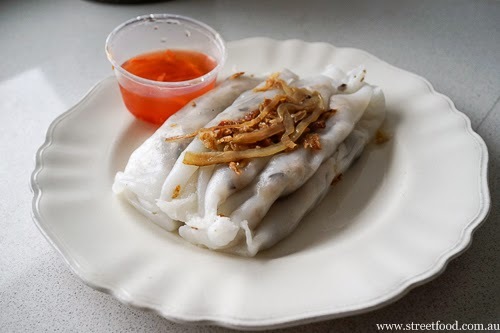 Banh Cuon (steamed rice rolls) from the takeaway options on top of the food bar. We love the mix of the soft rice noodle filled with a delicate sprinkle of cooked pork mince and prawns. Don't keep these in the fridge, as the rice noodle will go hard and brittle, any excuse to eat them as quickly as possible. 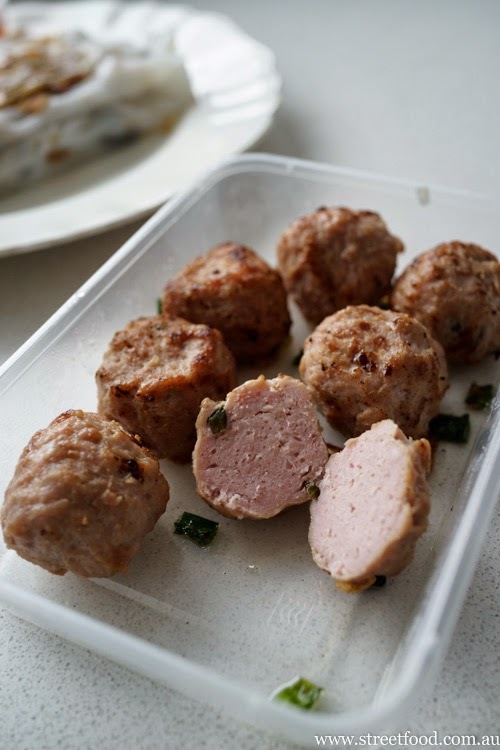 We also get some pork meatballs to takeaway. We planned to make a sort of bun thit nuong with these but they turned into lazy Vietnamese style rissole sandwiches. With sauce of course, tomato for Shawn and sweet chilli for Alison. It's a wild and crazy feast in our house, folks. 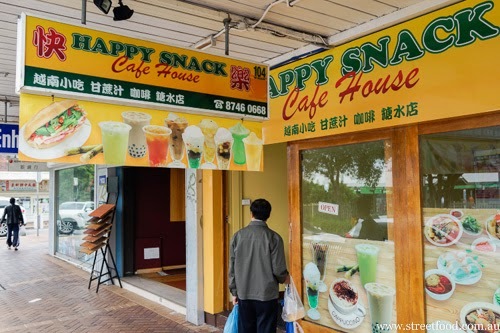 Happy Snack Cafe House is at 104 The Crescent, Homebush West NSW 2140. 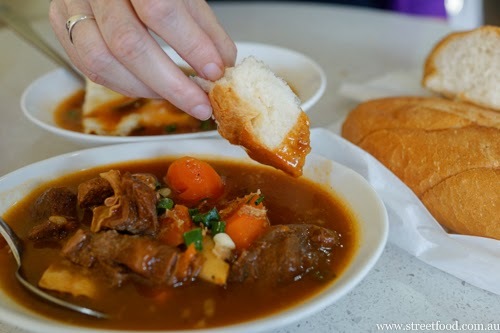 That Bo Kho looks delicious; great on a cold night or morning. Slow cooker/ pressure cooker - I couldn't quite get there - I've tried to cook it at home and never had a genuine success. Are you sure it was dates in the drink - maybe dried sour/salted plum? Why cook when you can get it so good and so cheap? I do think it was something like a Chinese red date, it had a slightly course skin unlike a rehydrated plum.